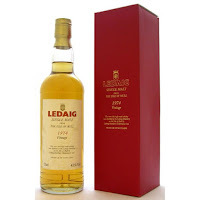 Ledaig is the peated whiskies from Tobermory Distillery. At first, I get some grass, hay and citrus in the smell. Vanilla sweetness with some light fruity and floral notes. Especially ripe pears. Some peat appears in the taste. A different type of peat than you normally get from Ledaig and it is very mellow. Some peppery notes as well. The peat is almost gone in the finish. You are left behind with the same notes that I first caught in the smell. Citrus, grass and hay. An old treat from Tobermory, but a different Ledaig than you normally get. The roughness and the peat is hard to find in this whisky, but fun to try a different style of Ledaig. I will give this 84/100 (20/21/22/21).